When my parents were growing up in Italy, there was no such thing as Halloween. The goblins, ghouls and jack o’lanterns arrived in Italy relatively recently via mass media and the spread of American pop culture. For my parents, there was instead La Festa di Ognissanti (All Saints Day) on November 1st and La Festa dei Morti (All Souls Day) on November 2nd. Yesterday, when I asked my mom what she remembered about these feast days, she gasped with delight. Her eyes sparkled and for a moment, she was a little girl in Sicily again. 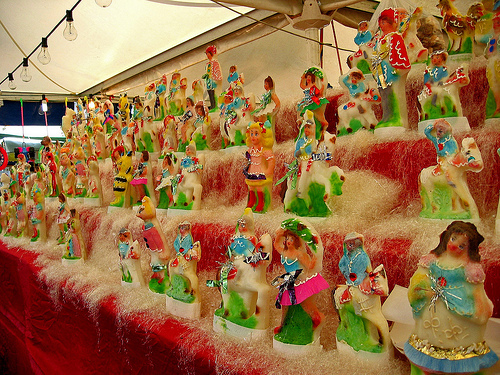 She told me that on the morning of i Morti, children would wake up to trays of intricate and colorful candy bambolette (dolls) and cavallucci (horses) called Pupi di Zucchero as well as lifelike marzipan frutta di martorana. Legend has it that on the night of Ognissanti, the dead come down from heaven to deliver gifts and treats to the loved ones they left behind. In the same spirit of La Befana, Santa Claus or the Easter Bunny, children are promised that if they dutifully respect their elders and pray for their departed relatives all year long, i morti will reward them. When my Zia Nina, my mom’s older cousin and godmother, became engaged, her future in-laws presented her with gifts on All Souls Day,and as the youngest of the family, my mom received a Pupo with a little gold chain around its neck….a way of saying “welcome to the family” from the other-world. While I would love to share my very own recipe for these extraordinary Sicilian confections, I simply don’t possess the requisite artistry. 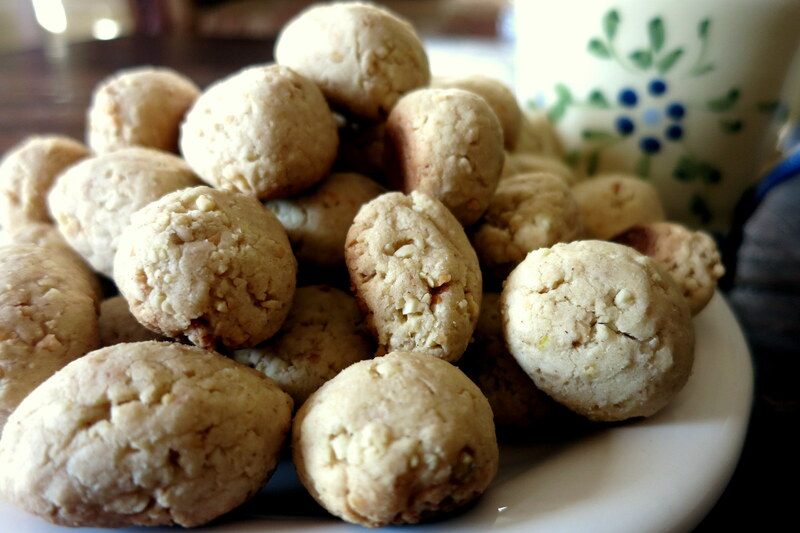 Instead, here’s a recipe for fave dei morti – fava beans of the dead – a chewy, little almond cookie prepared for All Souls Day throughout much of Italy. Wishing you all a happy week of feasting! Preheat your oven to 350 degrees and position racks in the upper two thirds. Prepare two cookie sheets with parchment paper or silicone liners. To the bowl of a food processor, add the almonds and pulse until they’re the consistency of almond meal (or slightly coarser if you prefer a bit of crunch in your cookie as I do. It’s best to err on the side of a coarser consistency – if you grind them for too long and the machine becomes too hot, the nuts will release their natural oils and become almond butter.) Transfer the almonds to a bowl, repeat with the pine nuts and set them aside. In a separate bowl or fluted measuring cup, lightly beat the egg, yolks, lemon zest and grappa together and set aside. In a separate large bowl, combine the flour, almonds and cinnamon and sift the confectioner’s sugar into the mixture. Add the chopped pine nuts and combine the dry ingredients, forming a well in the center. Pour the egg mixture into the center of the well and work the mixture with your hands until a compact and malleable dough forms. 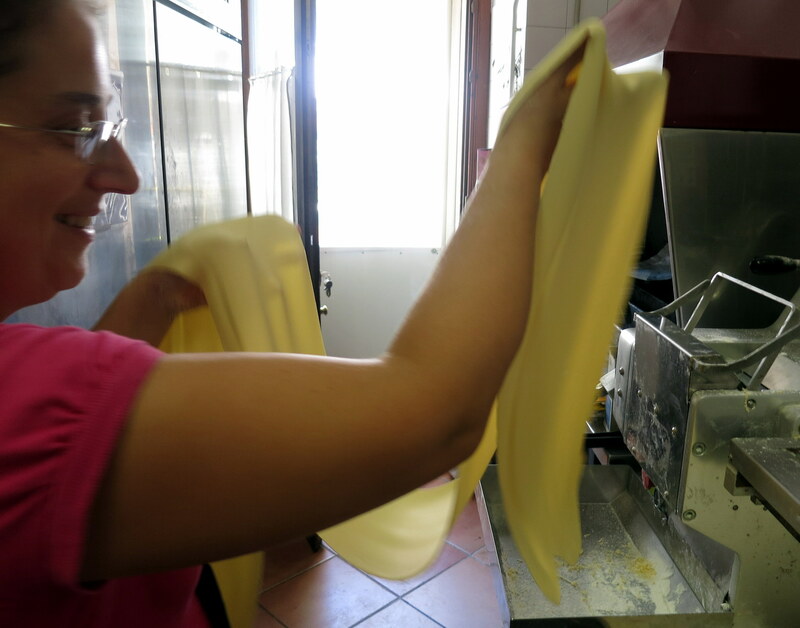 Working in batches, cut a piece of the dough, and with your hands, roll it into a thick rope. 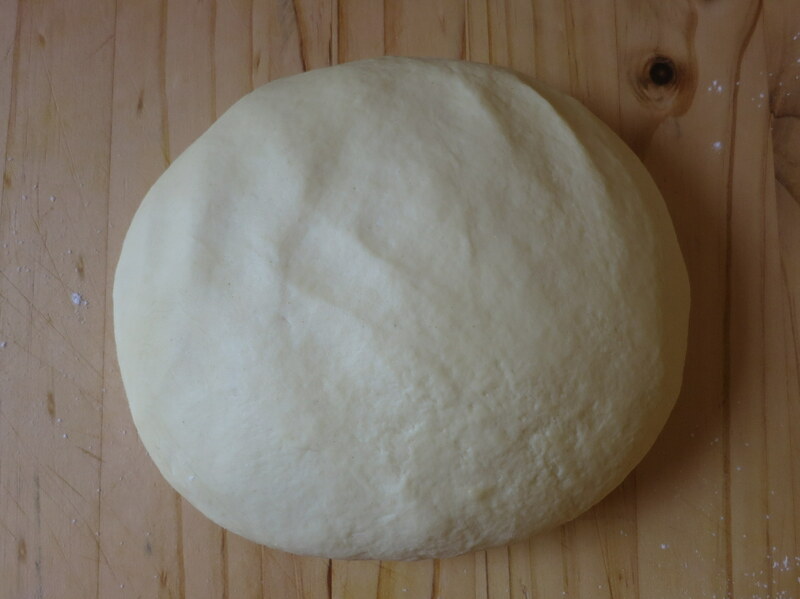 Working quickly so that the dough doesn’t dry out, cut the rope of dough into ¾-inch pieces and roll each piece of dough into a ball. Gently flatten the ball of dough so that it takes on a slightly oval shape (like a fava bean). Place the ovals, one inch apart, onto the cookie sheets. Repeat until you’ve shaped all of your cookie dough. Bake cookies for 10 minutes, until slightly golden and cracked on top. Allow to cool for 15 minutes. Buon appetito! Years ago, my husband and I dined at the acclaimed and utterly fabulous Cibreo in Florence. Lauded for its creative spin on Tuscan cooking, the restaurant is also known for the chef’s intentional omission of pasta from the menu. Although we thoroughly enjoyed and appreciated our dining experience, we couldn’t help feeling as if something was missing among the elegant courses. 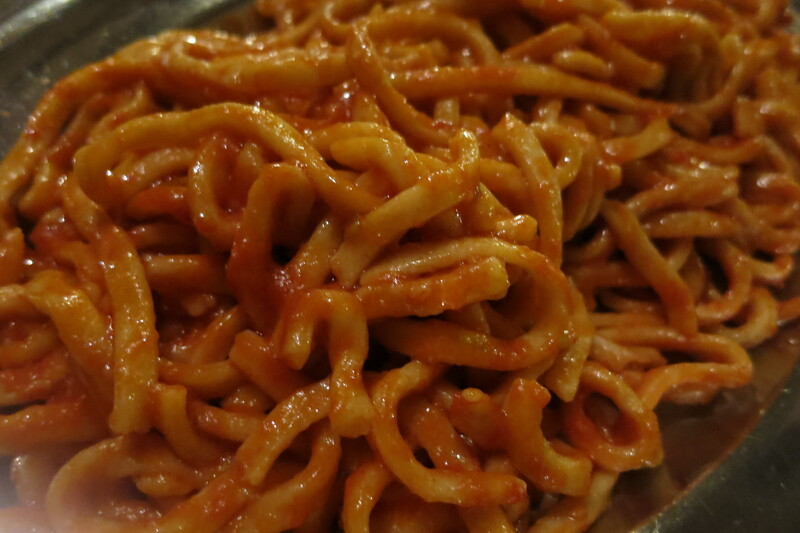 After all, what is a truly great Italian meal without even a small dish of pasta? 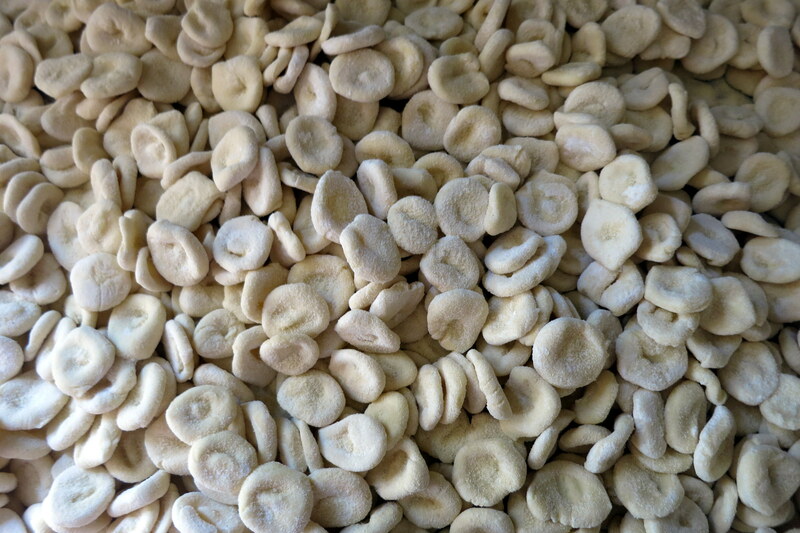 Fresh orecchiette – Puglia’s famous little ear-shaped pasta – have a toothsome texture and unique hybrid flavor between dried and fresh pasta (they’re made from semolina, water and salt – eggs, once considered a luxury, are not used in traditional pasta-making in Puglia). The most classic condimento – and my personal favorite – is broccoli rabe (also known as rapini or cima di rapa in Italian), garlic and anchovies and topped with toasted breadcrumbs (cheese was another luxury for Southern Italian peasants). PREPARE ANCHOVIES: Hold the anchovies under cold running water and gently rub off the salt with your fingers. Pat them thoroughly dry with paper towels and transfer them to a cutting board (preferably not a wooden board so that the smell won’t permeate the wood). Using the tip of a sharp paring knife, make a small incision along the bottom side and run your knife along the length of the anchovy. Gently peel back the top portion of the anchovy to reveal the backbone on the bottom portion. With the tip of your knife, gently remove the backbone and cut off the tail. 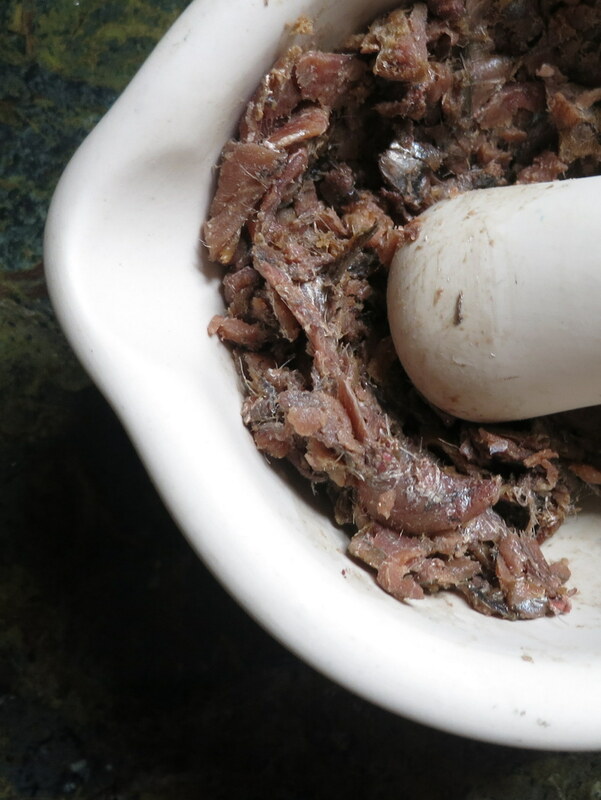 Finely chop the anchovy fillets or mash them to a paste in a mortar and pestle. If the flavor of salt-packed anchovies is too strong for you, you can soak them in milk for a few hours in the refrigerator after rinsing them to remove the salt. Rinse the anchovies again to remove the milk before filleting them. MAKE CONDIMENTO: Set olive oil over medium-low heat in a wide skillet until shimmering. Add the cloves of garlic, stirring occasionally until the garlic is browned on all sides. Remove the garlic from the oil and discard or reserve for another use. Add the chopped anchovies to the oil, lower the heat and, stirring frequently, allow them to cook until they seem as if they’ve dissolved or become part of the oil. Turn off the heat and add the crushed red pepper, if you’re using it. Reserve until you’re ready to dress the pasta. 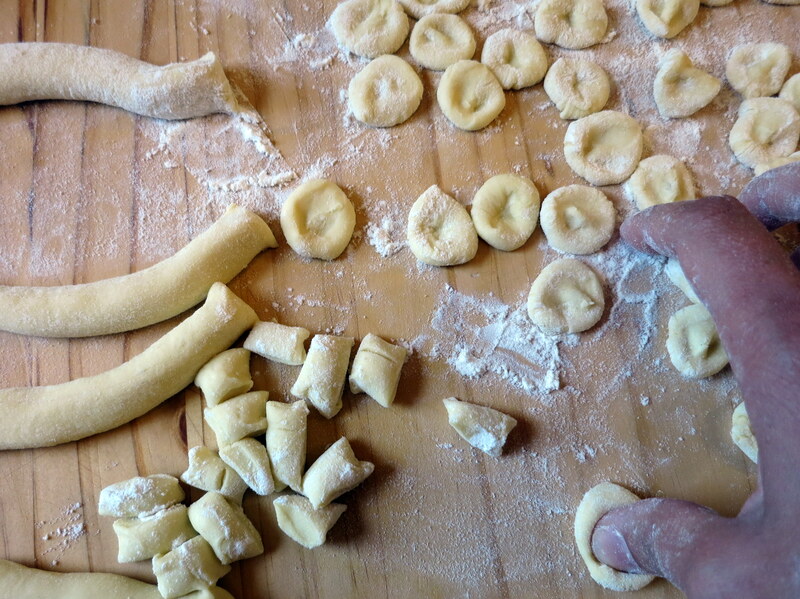 COOK AND DRESS THE ORECCHIETTE: Place a large pot of salted water to boil. When the water has reached an active boil, shake the excess flour from the orecchiette in a colander, add the pasta to the pot and return to a boil. (Meanwhile, set the skillet containing the anchovies over medium-low heat.) 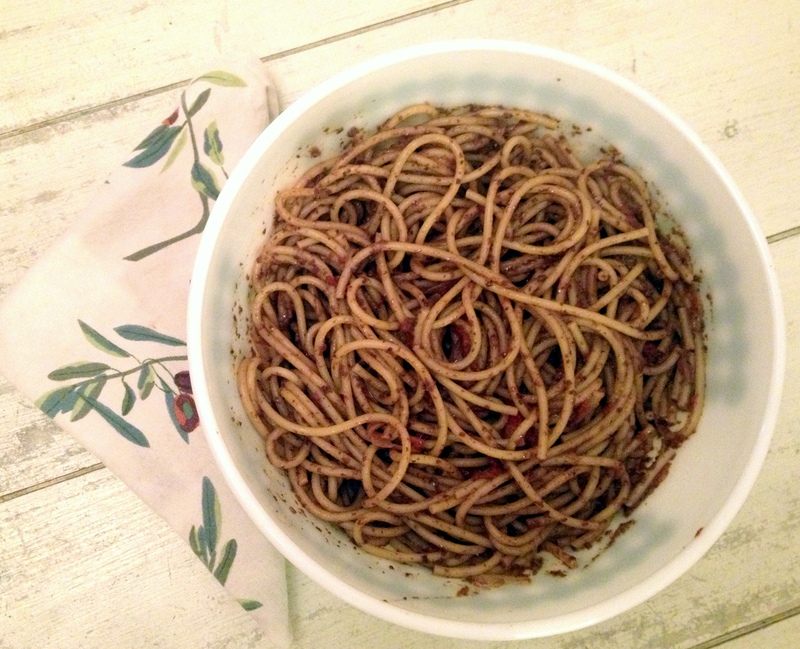 With a ladle, reserve a cup of the pasta cooking water (even if you don’t use it all). 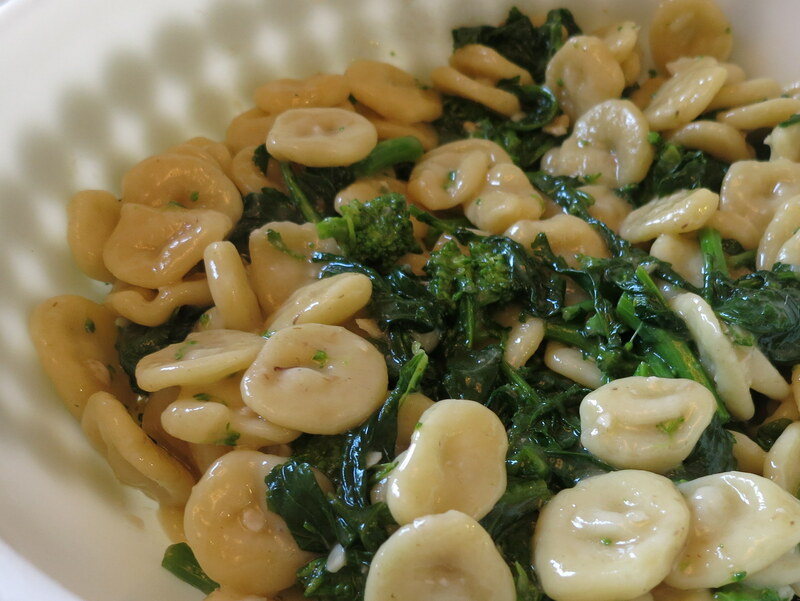 After the pasta has cooked for 4 minutes, add the broccoli rabe to the pasta pot and allow them to cook for one minute. Drain the pasta and greens and add them to the skillet that contains the anchovies, along with about ½ cup of the pasta cooking water (or more if it appears too dry). Toss well and allow it to simmer for about minute. Turn off the heat and transfer to a large serving bowl. 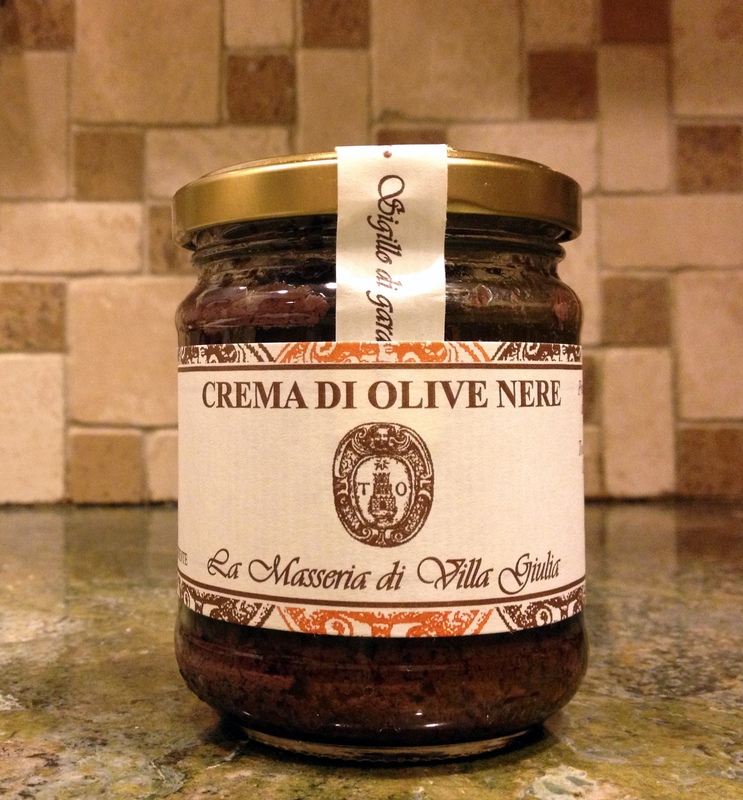 Drizzle with some more olive oil and serve with grated cheese or toasted breadcrumbs. Buon appetito! Socere e Nore: An oval bean known for its characteristic black and white hue, the bean’s color contrast is said to represent the complicated relationship between mothers-in-law (socere) and daughters-in law (nore). Farro: This ancient grain suffered a period in which it was threatened with extinction. 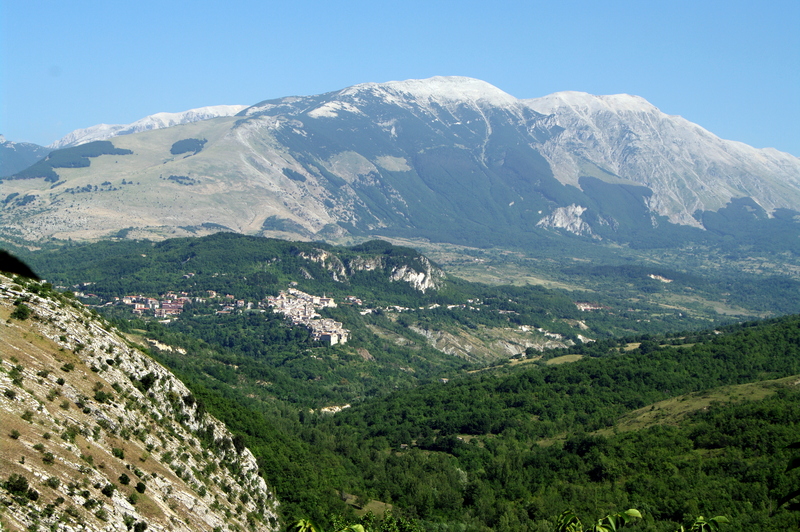 Many farmers in Abruzzo began to cultivate varieties from other Italian regions such as Umbria and Tuscany. In recent decades, however, interest in farro has resurfaced and some varieties indigenous to Abruzzo have been singled out and reproduced. 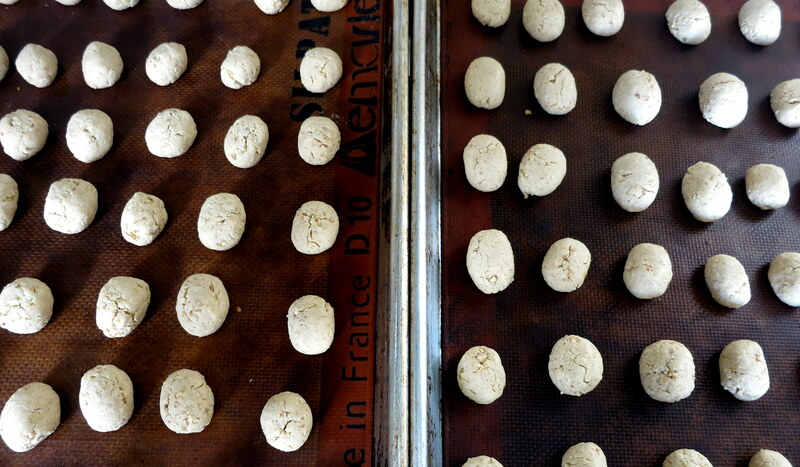 Farro is now sold in grains and as flour, pasta and polenta. Farina di Solina: Solina is the characteristic wheat found in the mountains of Abruzzo. It imparts a particular taste and fragrance to homemade bread and pasta and resists well in the cold mountainous climates. An 18th century text describes solina as a wheat from which “…one of the best kinds of bread of the Kingdom (of Naples)” was baked. 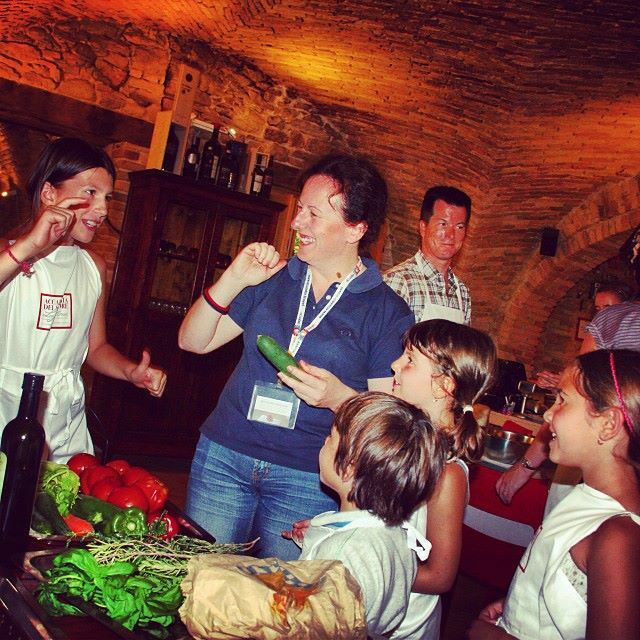 A bookend to “Coltiviamo la diversità” is an initiative called “Cuciniamo la diversità” (“Let’s Cook Diversity”) which consists of a network of restaurants and agriturismi within the Parco Nazionale della Majella. Conceived as meeting points between producers and consumers, these establishments offer traditional dishes from Abruzzo that utilize local products cultivated by the Parco’s custodian farmers. One of the most memorable and inspiring meals I enjoyed during my stay in Abruzzo was at Agriturismo Tholos in Roccamorice. Tholos is both a custodian farmer as well as a participating restaurant in the Parco’s network. Its organic farm stretches over 10 hectares and consists mainly of farro, Solina, chick peas and lentils (actually, the same tiny lentils that come from Santo Stefano di Sessanio, a village near the Gran Sasso mountain range; Tholos, in partnership with the Parco, is trying to cultivate the delicate legume in the Majella’s territory) as well as an orchard of local indigenous apples and pears. These typical “tholos” stone structures were constructed by farmers of the Majella to protect their animals during the hostile winters. This replica can by found at Agriturismo Tholos in Roccamorice, Abruzzo. I enjoyed creative dishes made entirely from Tholos’ products including zuppa di lenticchie made with lentils that were picked earlier that day, polenta di farro (a first for me as well as for our Abruzzese friends who joined us for dinner), fresh pasta called “corde” made from farina di Solina and a homey, comforting pasticcio di farro, which I share below. The food was positively stellar, but even more satisfying was the knowledge that in some small way, I was sharing in the preservation and celebration of the gastronomic heritage of this territory which I love so very much. This baked farro “pasticcio” (literally, a “mess”) is filled with late summer vegetables and gooey scamorza cheese. Feel free to substitute other seasonal vegetables and cheeses. Preheat oven to 400 degrees. 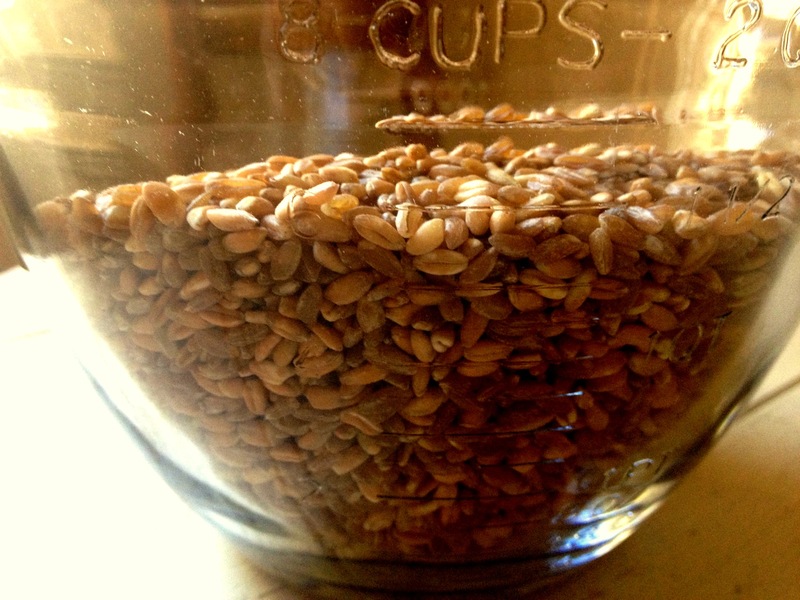 Rinse the farro with cold water. Bring a large pot of salted water to boil and add the farro. Reduce the heat to medium-low and simmer, uncovered, for 20 minutes. Add a tablespoon of salt and cook for another 5 minutes, or until the farro is tender but still has a bite. (Adding the salt before this point will make the farro tough.) Drain well, transfer to a large bowl, add a tablespoon of olive oil and fluff with a fork. Set aside. Meanwhile, in a wide sauté pan, heat the olive oil over medium heat until it starts to shimmer. Add the eggplant and ½ teaspoon of salt, and cook, stirring often to prevent sticking, about 3-5 minutes or until the eggplant starts to color and soften. Next, add the zucchini to the pan along with another ½ teaspoon of salt, and cook for an additional 3-5 minutes, until the zucchini starts to color and soften. Add the red onion and another small pinch of salt and continue to cook until all of the vegetables have caramelized and softened and the flavors have melded together. Remove from the heat and fold in the grape tomatoes, allowing the residual heat from the other vegetables to soften them. Adjust the seasonings and add the vegetables to the cooked farro and stir to incorporate. Next, fold in the shredded scamorza cheese. Pour the mixture into an oiled baking or casserole dish and sprinkle the grated Parmigiano-Reggiano across the top. Bake in the oven for about 20 minutes or until the cheese has melted and the Parmigiano has formed a golden crust on top. Buon appetito! The farro may be cooked ahead of time and refrigerated overnight, tightly covered. Remove from the refrigerator at least one hour prior to baking and add proceed with the recipe. 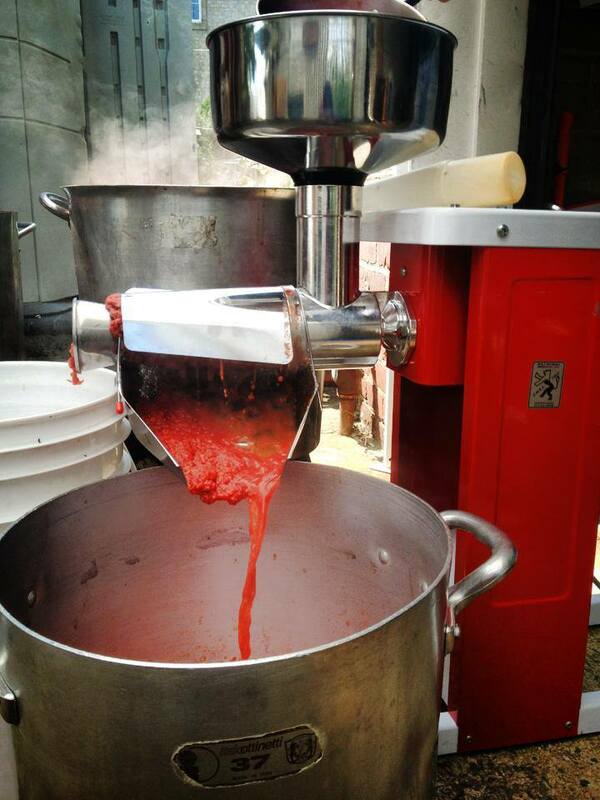 If you’ve been following me on Facebook over the past few weeks, you probably know that I’ve been in the throes of making and jarring homemade tomato sauce since I returned from Italy. The other night, I actually dreamt I was stirring a giant cauldron of bubbling tomato sauce and when I paused to rest my arm, the sauce continued to stir itself, as if possessed by some rogue force. I suspect that plowing through 3,500 pounds of tomatoes (yes, that number is correct) over 8 days has made me a bit batty. Throughout my life, things always felt askew during tomato week. As a child, I resented my parents’ utter preoccupation, the transformation of our basement – my playroom – into a sauce-making factory, and my grandmothers’ constant bickering in Italian over whose method was better (“Signora, put the olive oil in now,” said Nonna Irma. “No, Signora, the sauce will turn black if you add the oil too soon,” responded Nani – it’s significant to note that although good friends and in-laws, my grandmothers addressed each other as “Signora” their entire lives). 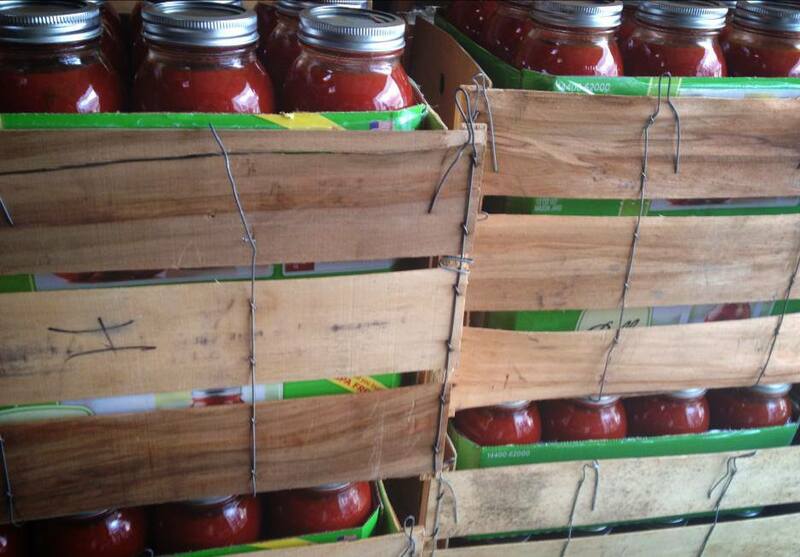 Southern Italians take their tomato sauce very seriously. My mother strictly forbade me to ever share my family’s recipe (as if anyone needs a recipe based on 50 pounds of tomatoes – I’ve included a more practical, small batch recipe at the end of this post). For Italian immigrants, the sauce was not only a pantry staple, but a way of preserving their identity in this strange new world. 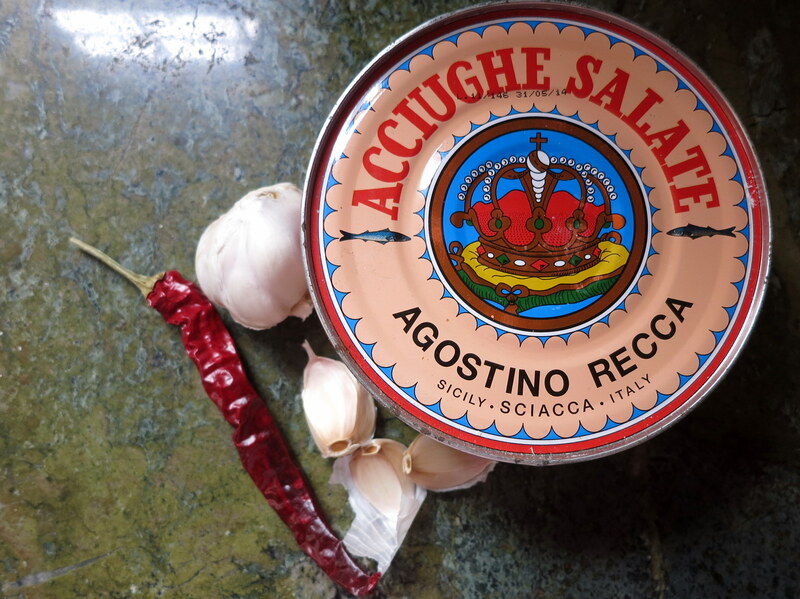 My dad, who immigrated to the United States with his mother, father and younger brother in September 1966, told me that prior to his family’s arrival, his aunt, Zia Assunta, made extra sauce for them since tomatoes would be out of season by the time their ship came in. Two beds, a couch, a small table and chairs, a few pots and pans and 100 jars of tomato sauce – those were the contents of their first American home. Every August, in Queens, New York, you can spot throngs of Italians crowded in front of their neighborhood garden centers as they anxiously await the arrival of the tomato delivery truck from local New Jersey farms. 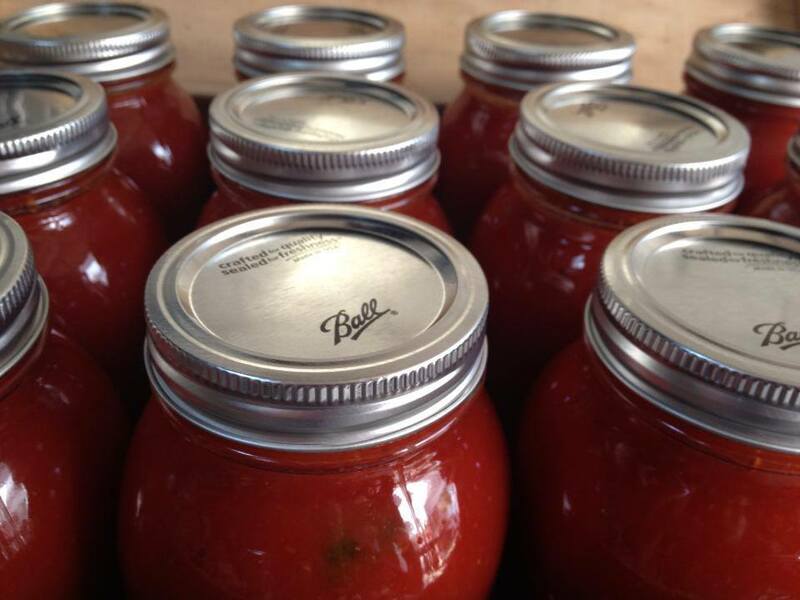 Many swear it will be their last year of fare i pomodori – it’s too much work, our kids don’t help, our “American” friends expect us to give jars away – BASTA. These are the usual complaints, but lo and behold, these lamenters’ garages fill up with wooden crates of tomatoes the following August. It is said that the world would be populated with only children if mothers remembered every detail of the birth of their firstborn. Well, it’s the same with making tomato sauce – you willingly forget the back-breaking work while you enjoy the fruits of your labor all year long. 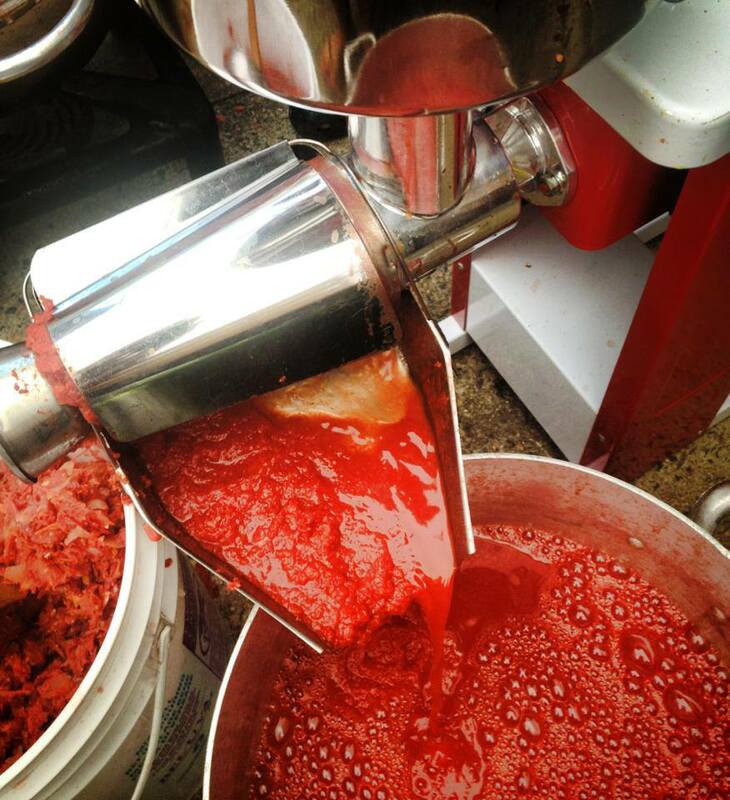 The machine is like a gargantuan, motorized food mill that separates the tomatoes’ pulp and juices from their skins and seeds. Last year, a friend who cans tomatoes with her grandmother told me I was crazy when she learned I had ramped up my usual production in order to offer jars to my catering clients. I guess I am a little crazy, as is she – anyone who throws their lives into this back-breaking upheaval is indeed a little crazy during those few days or weeks. However, it’s a matter of legacy and if we don’t preserve it, something immeasurably more precious than jars of tomato sauce will be lost. 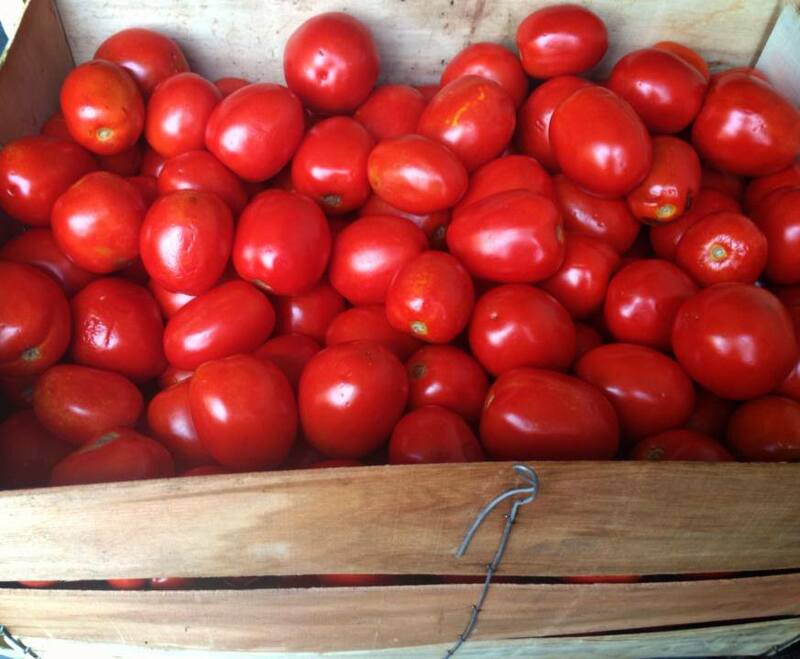 So to all of you unsung artisans who have continued this crazy/beautiful tradition of fare i pomodori – EVVIVA!! Salsa Pronta – This is what I do. 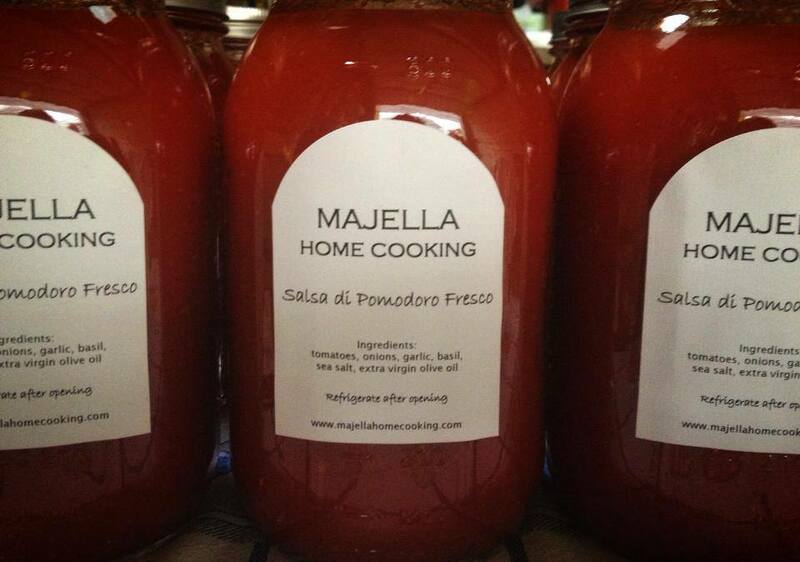 It’s a finished tomato sauce that has been slow-cooked with onions, garlic, sea salt, olive oil and basil. Simply open, heat and dress your pasta. I also use it as a base for quick tomato-based broths, soups and stews and on pizza. 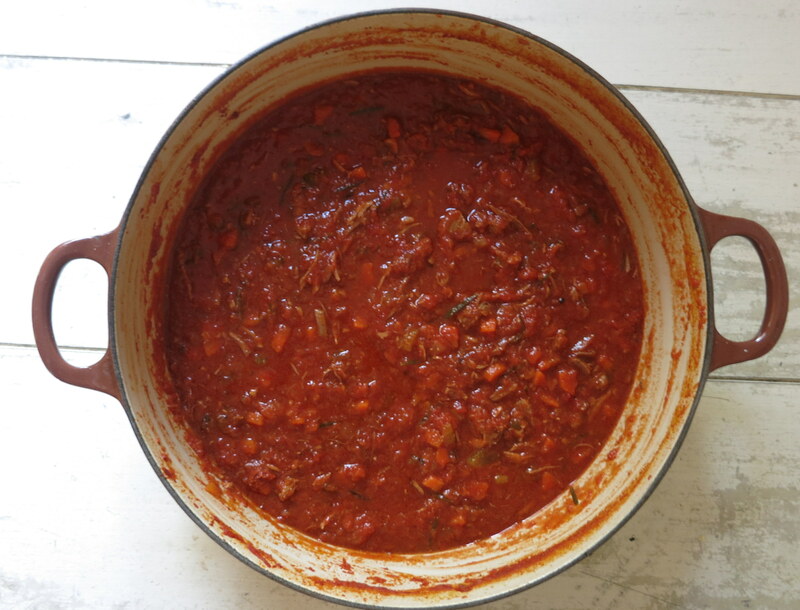 Most Italians prepare passata or pelati (see below), but “salsa pronta” has always been a tradition in my mom’s family and as a result, I’ve never (voluntarily) eaten store-bought tomato sauce. Passata di pomodoro – The most common canned tomato preparation is passata, a quickly cooked tomato puree that is strained of seeds and skins and then jarred for later use. 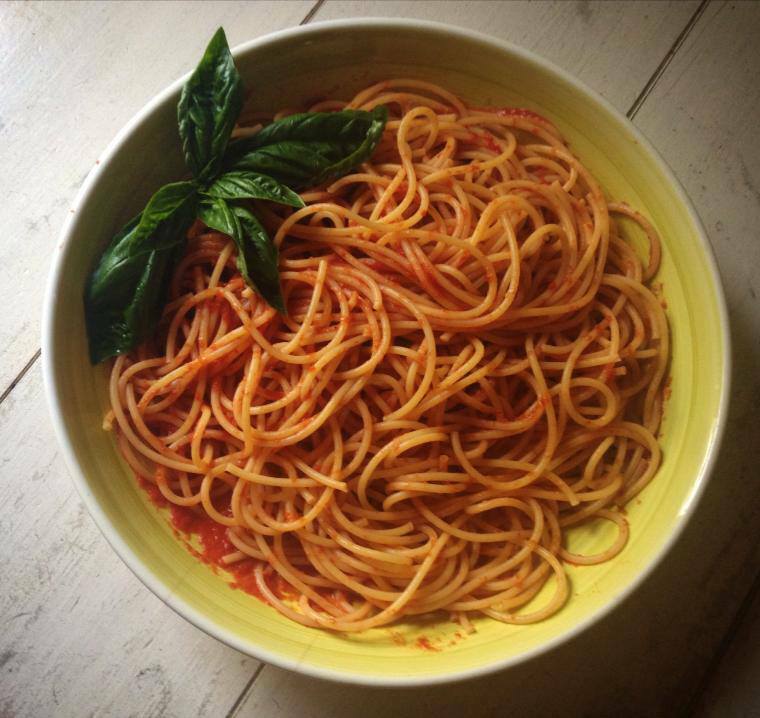 Unlike salsa pronta, passata is typically unseasoned or minimally seasoned with a bit of salt and basil. 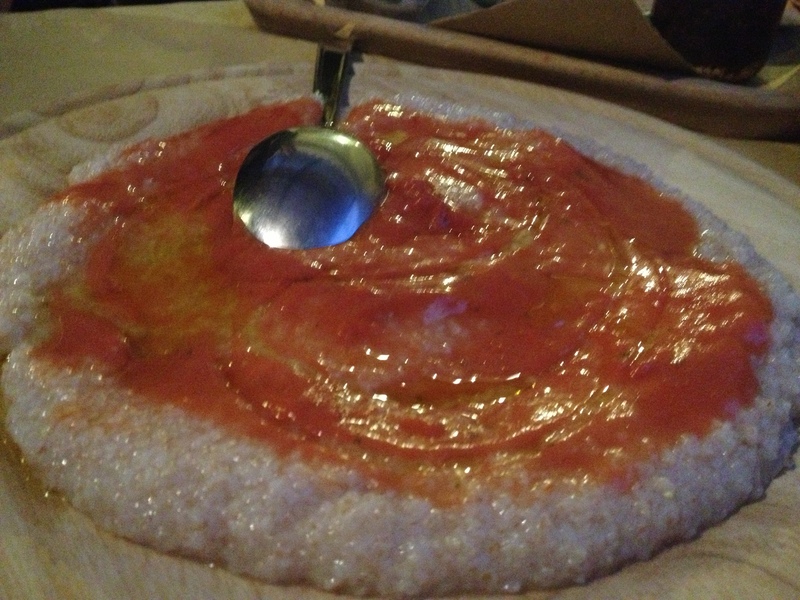 The onions, garlic or other seasonings are added later, when you prepare a finished sauce using the passata as a base. 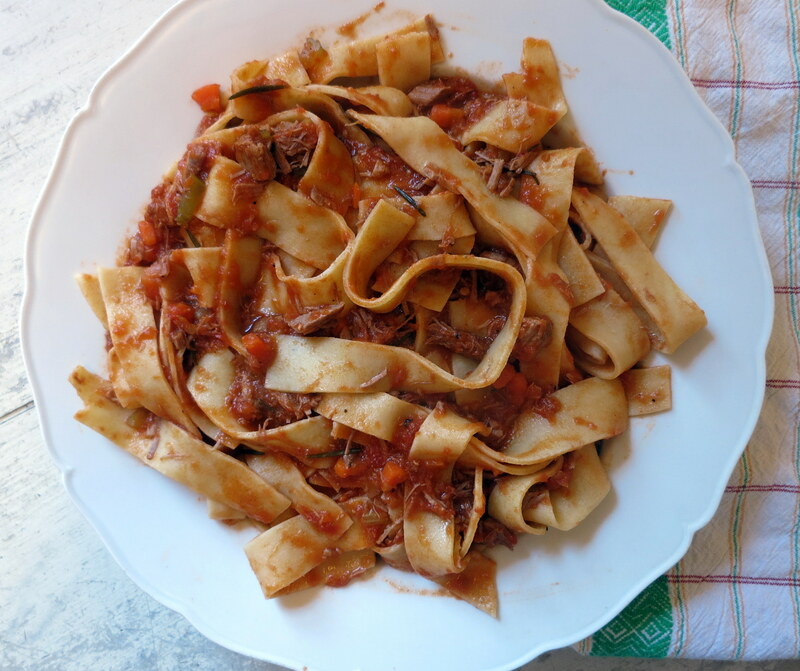 Pomodori Pelati – Similar to passata in that the tomatoes are quickly blanched, pomodori pelati are whole, peeled tomatoes that are canned or jarred. This is what you typically find in supermarkets here in the US, the best of which are imported San Marzano tomatoes from the region of Campania. In addition to salsa pronta, my family also jars “pelati” for use in various pasta sauces, soups and stews. Using the point of a paring knife, cut out and discard the stem bases of the tomatoes and then lightly cut X-shapes on the tomatoes’ opposite ends. Bring water to a boil in a large saucepan, drop in the tomatoes, and cook for 3-5 minutes, until the skins appear to be breaking. With a slotted spoon, transfer the tomatoes to a colander and briefly run cold water over them. 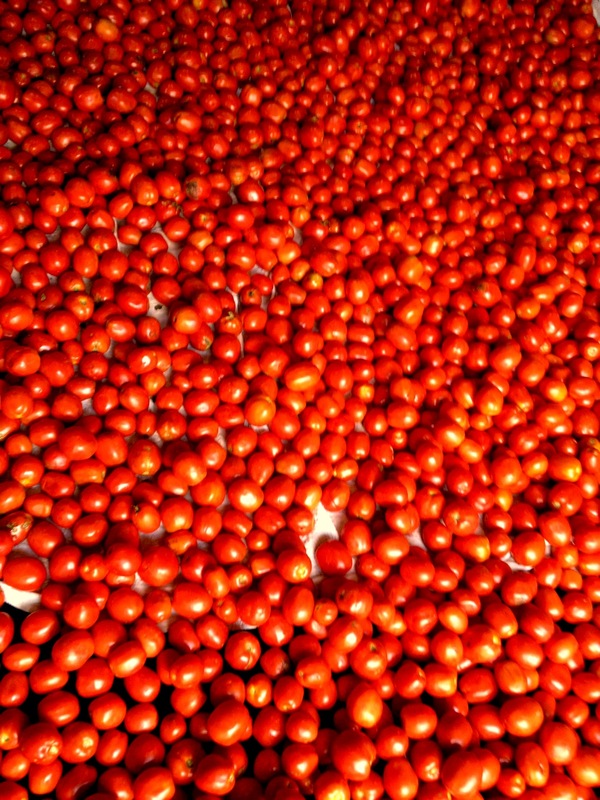 Position a food mill over a large bowl and pass the tomatoes through the food mill to “weed out” the skins and seeds. 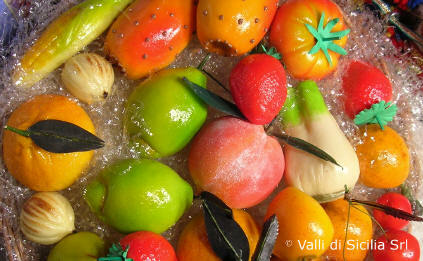 Reserve the pulp and juices of the tomatoes and discard the skins and seeds. (If you don’t have a food mill, remove the skins and seeds by hand. Crush the tomatoes by hand for a slightly chunkier consistency, or in a food processor for a smoother sauce). In a nonreactive saucepan, lightly sauté the onion in two tablespoons of the olive oil over medium low heat, stirring often (be careful not to burn them). When the onions are soft and golden, add the minced garlic and sauté for one minute, until almost golden. Add the reserved tomato pulp and juices along with the basil and raise the heat until the tomatoes reach a boil. Lower the heat and simmer gently for 15 minutes, stirring occasionally. Add the remaining tablespoon of olive oil and salt to taste and simmer for an additional 10 minutes. Adjust the seasonings and serve with your favorite pasta shape. Any unused sauce may be stored in a vacuum-tight container in the refrigerator for up to 7 days or in the freezer for up to 3 months. In the spring, cookbook author Domenica Marchetti paid tribute to one of her culinary idols on her blog. Today, it’s Domenica’s turn to take the spotlight. 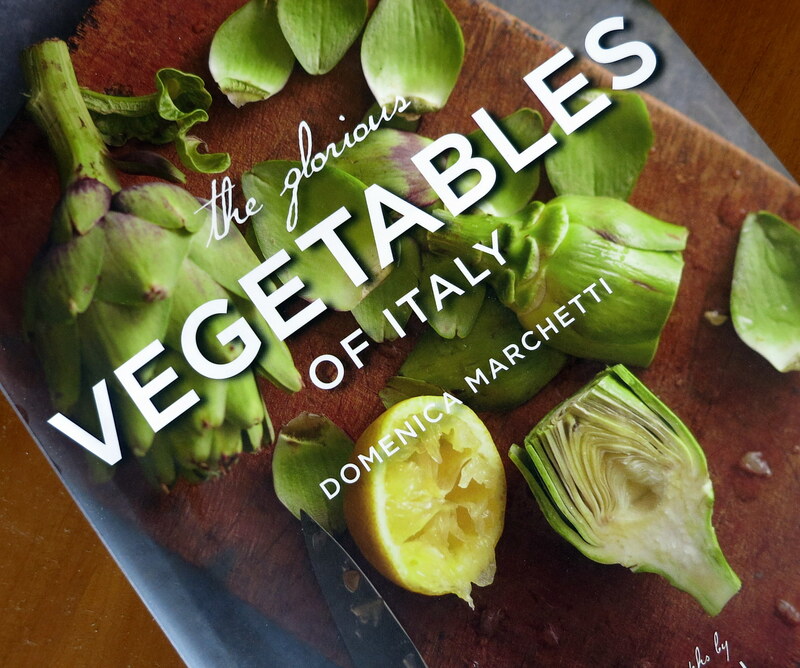 A brilliant home cook, eloquent writer and proud (fellow) daughter of Abruzzo, my friend Domenica’s latest cookbook, The Glorious Vegetables of Italy, is stunning. 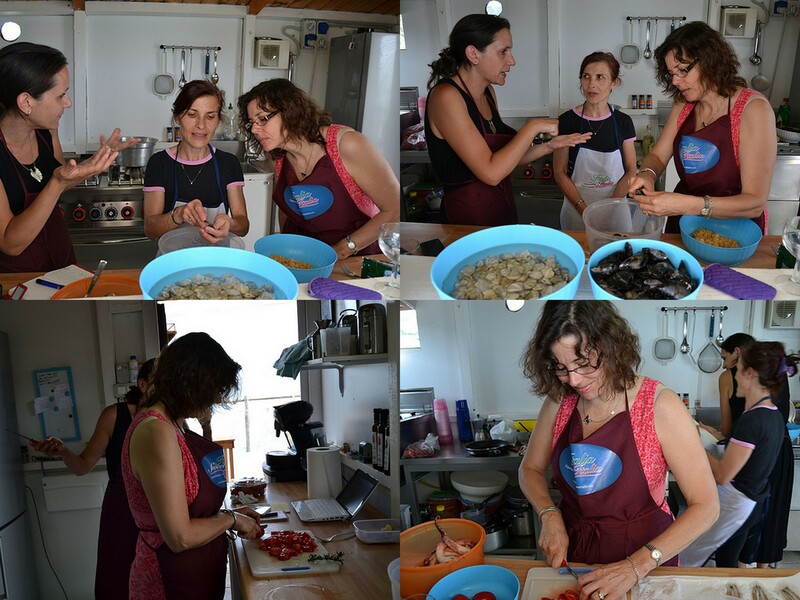 I was fortunate to witness Domenica in action this summer when our families spent a food-filled day together on Abruzzo’s fabled Costa dei Trabocchi. Domenica is as thoughtful in her cooking as she is in her writing. Now, I’m admittedly a bit of a chiacchierona (chatterbox) and become particularly gregarious in Italy, where a double dose of adrenaline kicks in the moment my plane touches down. During our seafood cookery class on a trabocco, a spider-like fishing platform that juts into the Adriatic Sea, I couldn’t help but wonder whether Domenica secretly wished she could ask me to please pipe down as I babbled and gesticulated excitedly throughout our lesson (see proof below). However, Domenica good-naturedly endured my prattle while she instinctively cleaned briny mussels and diced sun-ripened tomatoes. (Domenica’s solicitousness has been passed down to her two teenagers who willingly entertained my three little boys all day). 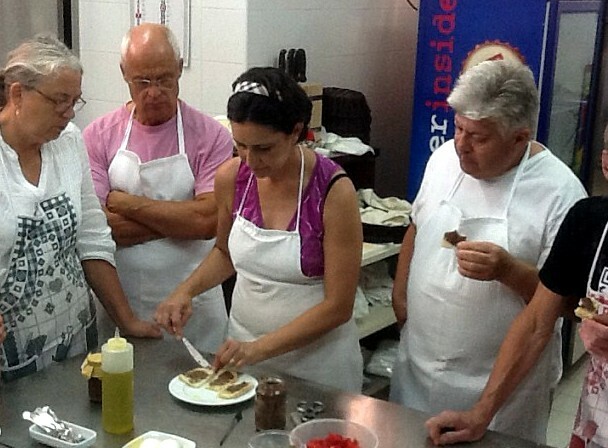 Later that evening, we were treated to a pre-dinner baking lesson with our friend Fabrizio Lucci’s mom and godmother. Admittedly, neither of us was able to keep pace with Rosa, who nimbly and effortlessly shaped the delicate cookies called celli ripieni into perfect crescents. Towards the end, however, I began chit-chatting with Mamma Anna Maria while Domenica – who, by this point, was feeling the effects of jetlag – diligently persevered until she mastered the technique. 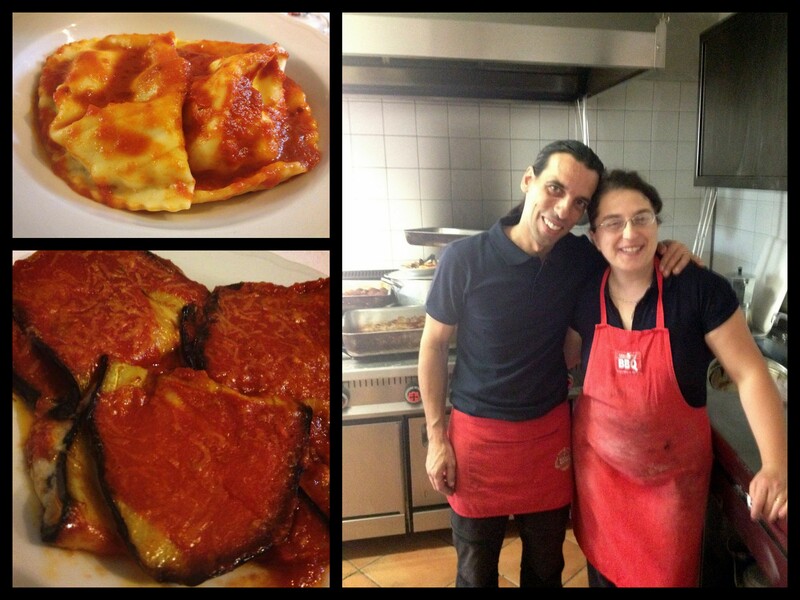 So here’s to you, Domenica, one of my culinary idols … auguri infiniti. 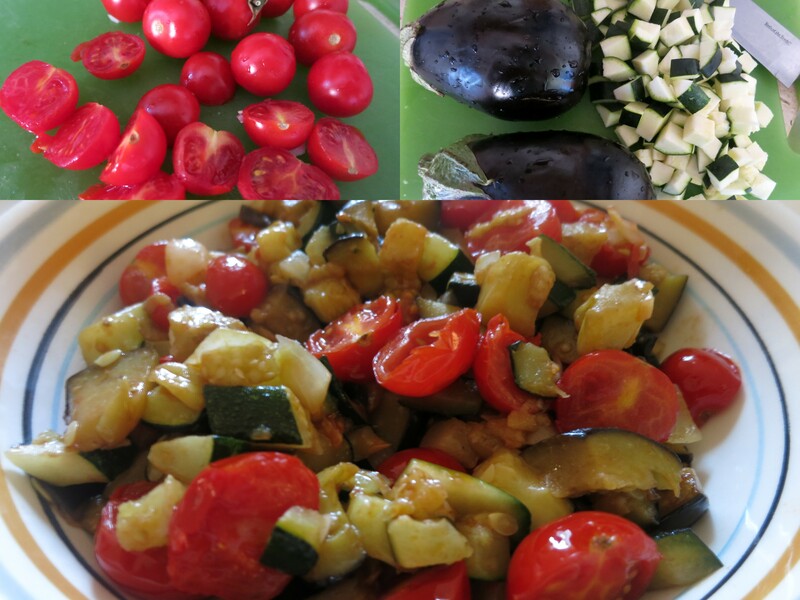 I looked to my garden for guidance in choosing my first recipe to try from The Glorious Vegetables of Italy. 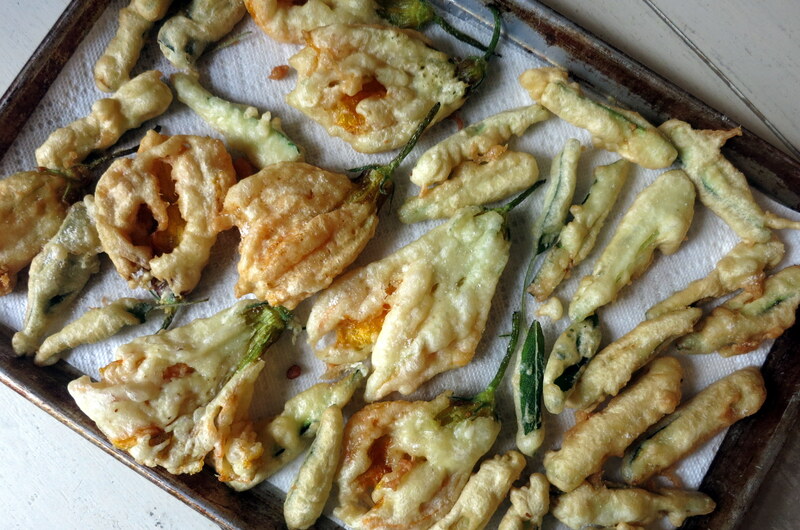 This may be my last week for zucchini blossoms (“fiori di zucca”) and in my opinion, there’s no better way to enjoy them than battered and fried. 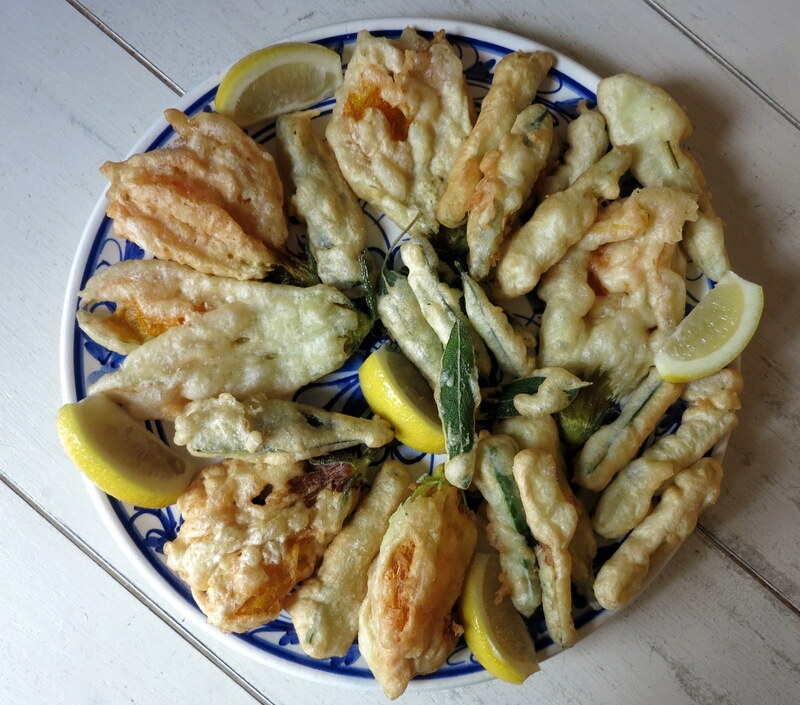 In her recipe, Domenica also recommends adding baby artichokes to the fritto misto (which I didn’t have on hand). I did, however, have the fresh sage leaves she suggests and trust me, this ingenious addition to your fritto misto is a must. In a medium bowl, whisk together the flour, water, egg, and fine sea salt to make a smooth batter about the consistency of heavy cream. Cover loosely with plastic wrap and let it rest for 20-30 minutes. Pour enough oil into a medium skillet to reach a depth of ½ to ¾ inches. Place over medium-high heat and heat the oil to 375 degrees F (190 C) on a deep-frying thermometer (if you’re using another type of oil, adjust the temperature if needed). To test the oil temperature, drop a small amount of batter into the hot oil. It should sizzle and float to the surface immediately, and quickly turn golden. Have ready a paper towel-lined baking sheet for draining the oil. Drop the zucchini blossoms in the batter (stems up) and then transfer them immediately to the hot oil. Fry the blossoms in batches, taking care not to crowd the skillet, for 2 minutes, use a fork to turn and fry for another 2 minutes, until golden brown and crispy. With a slotted spoon, transfer the blossoms to the prepared baking sheet. 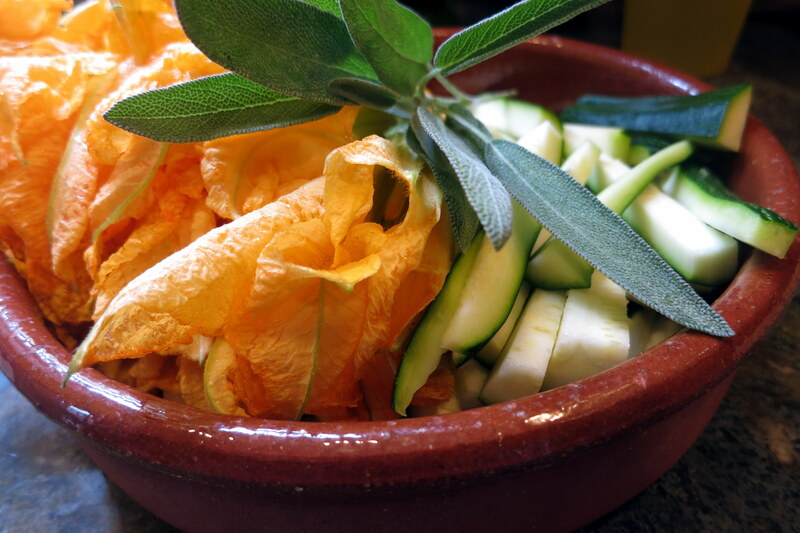 Fry the zucchini wedges and sage leaves in the same way, turning them once as they cook. When all of the vegetables have been fried, transfer them to a serving platter and sprinkle a little coarse sea salt over them. Arrange the lemon wedges on the platter and serve immediately.